As Hunter-Reay lamented during his Post-qualifying interview; NO! I’M NOT HAPPY with second; anytime you can jump up and (SLAP-SLAP-SLAP) PUNCH Penske and Ganassi in the face – you’ve gotta take advantage of it! CRIKEYS! Careful Mate, I think perhaps somebody name Ryan “The NEW IZOD Dude” Briscoe may still wish to give you an “Hertz Dounghut” for last week’s takeout at the Barber’s, eh? And what’s the dealio with Scotty “Kleenex” Dixon’s continuous WHINING! As recently I posted a story title: Kiwi ‘Wingeing... To which Mary Ellen said, did you explain what “Wingeing” means? Whale it’s something I picked up Down Under, which I came to interpret as slang for Whining, which is exactly what Dixie’s been doing the past 2-weeks; C’mon Mate, get on with it, will Yuhs! What About Those Fast Six? Meanwhile two multiple LBGP winners named ‘PT and the Hamburgular, a.k.a. Paul Tracy and Sebastian Bourdais, with four and three wins respectively, seemed to have seen their “Glory Days” go out with the tide? As SeaBass rolled off P21 in the lowly Dale Coyne Racing entry, whilst The Chrome Horn’s (Tracy) Dragon Racing entry started P25, with only Ana Beatriz and J.R. Hildebrand slower... As we all know about Marco and Sebastian’s coming together, not to mention Tracy’s controversial penalty! And speaking ‘O “Captain America,” (J.R. Hildebrand) I see he’s continued making friends with THE GRAMINATOR, nee Graham Rahal – who sounded pretty livid after having had his final qualifying run SCREWED by J.R., as Graham didn’t mince words ‘bout how that’s two weekends in-a-row that all JR’s been able to say is: I’m sorry... Hmm? Suppose Rahal won’t be sending him any Christmas cards, eh? Especially after having read ‘bout how The Son ‘O Stash mighta been tempted to toss a Frapachino his way; Hya! And lastly... Whale! I’ll leave it to Y’all to decide which ‘Juan’s Michael and witch ‘Juan’s Paul; Err, Ebony or Ivory? Hya! As I can only guess why somebody’s astute observations during the Long Beach weekend brought a Goofy-grin to my face... Let’s see, Goofy, Los Angeles, Disneyland; Oh Never Mind! That’s what Mr. Innucci wrote in his Saturday at Long Beach post... As lets see if we can connect-the-dots, shall we? 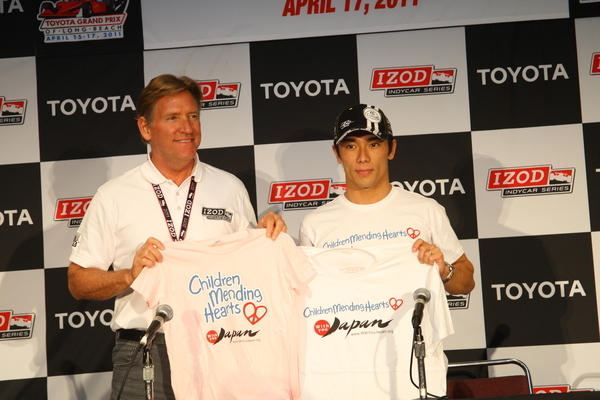 As in One: Hopefully Mr. George was visiting ‘TakuSan (Takuma Sato) to give him a healthy donation cheque for his With You Japan charity campaign. Two: TG’s hoping to ink Thee Leggy ‘Juan to a long-term multi-year contract for his defunct Vision racing team whilst searching for the next Milka duno; Err, scratch that (MEOW!) DannaWho’s replacement, eh? And Three: Robin Miller sez: NO COMMENT! As what’s that ‘Ol saying ‘bout know who your friends are – but keep a closer eye on your enemies... Hya!